Nature's unrelenting feedback will gradually drive ruling political authorities to extinction. Advancing social ideas that do not demand obedience or compliance requires far more personal patience than simply forcing others to comply via the political ballot box. 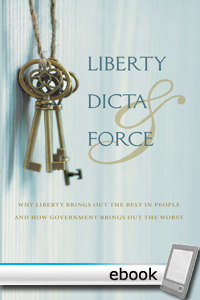 The widely held idea that dicta and force can serve a useful purpose will eventually fade into backward thinking in the so-called public sector as it has in the private sector. Time, nature, reason, and the human spirit will see to that. Irrespective of good intentions or the approval by consensus, nature's unrelenting feedback will gradually drive ruling political authorities to extinction.